Conditional Row Deletion for Excel deletes rows in an Excel worksheet based on certain conditions. Up to four conditions can be specified across four columns. The columns can be contiguous or non-contiguous. At least one condition is mandatory and the remaining three conditions are optional. 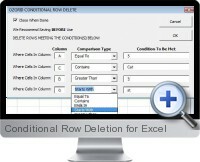 Conditional Row Deletion for Excel is compatible with Excel 97 or above.